With the exhibition Just Not Australian, at Artspace, closing at the end of April, we took the opportunity to sit down with curator Talia Linz and artist Tony Albert. The exhibition will tour nationally with Museums & Galleries of NSW, from May 2020. Just Not Australian brings together a group of 19 living Australian artists across generations and mediums to deal broadly with the origins and implications of contemporary Australian nationhood. This timely exhibition showcases the common sensibilities of satire, larrikinism and resistance in order to interrogate and interpret presenting and representing Australian identity. The impetus for this exhibition has come from the public discourse around its title, of what it means to be ‘unAustralian’. The exhibition engages with the moral and ethical undertones of this loaded rejoinder, that has entered more popularly into our national political lexicon, of how this is defined and by whom. Terror Nullius by Soda_Jerk forms the central focus point of the exhibition, a work that aptly looks at Australia’s national mythology, encompassing ideas of visibility and inclusion. 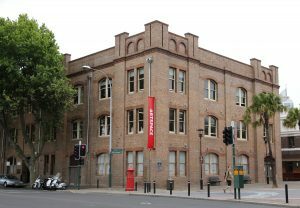 Just Not Australian was curated by Artspace and developed in partnership with Sydney Festival. The exhibition is touring nationally with Museums & Galleries of NSW.